TriMet’s Board of Directors adopted the agency’s Fiscal Year 2019 budget this morning, ushering in the agency’s largest ever expansion of bus service. In addition to increasing service hours and frequency on buses, the FY2019 budget brings back round-the-clock bus service and introduces a new, late-night bus line serving the Portland International Airport. Other exciting improvements include additional trips to OHSU and Marquam Hill, a highly anticipated extension of Line 24-Fremont across the Fremont Bridge into Downtown Portland, and more frequency on Line 73-122nd and 81-Kane/257th, serving East Portland and East County. Earlier and later trips, more weekend frequency, shorter wait times and better connections are on the way in the coming year. Under the FY2019 budget, TriMet will make a sweeping number of service improvements to help riders get to jobs, schools, services and more throughout the tri-county service district. Expanded hours of operation on bus lines serving OHSU and Marquam Hill – Lines 61, 64, 66 and 68 – helping accommodate work shifts and giving patients more flexibility. More than 20 additional weekday trips on Line 81-Kane Rd/257th provide better access to jobs in the Troutdale Reynolds Industrial Complex. Extension of Line 24-Fremont across the Fremont Bridge connects with MAX in Downtown Portland and opportunities in Washington County. Later trips on MAX and all-night bus service to Portland International Airport mean more options for workers at PDX and in the employment-rich Columbia Corridor. Splitting Line 4-Division/Fessenden into two helps keep buses on time on one of our lengthiest and most popular routes. Additional trips on Line 20-Burnside/Stark and Line 57-TV Hwy/Forest Grove bring 24-hour bus service back to the Portland area for the first time in 30 years! Better frequency on Line 73-122nd Ave, with weekday service available every 15 minutes, most of the day. More service, more often on Line 96-Tualatin/I-5, including 25 new midday trips between Tualatin and Portland. 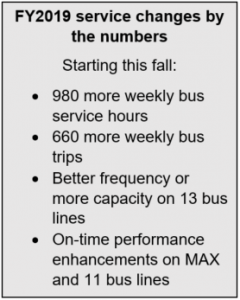 The FY2019 budget ushers in a new era for TriMet bus service. We’re adding five battery-powered electric, zero-emission buses to the fleet as we explore the viability of cleaner and greener technology. The buses, which offer a quieter, smoother ride, will be tested in-service on Line 62-Murray Blvd. TriMet will continue modernizing its bus fleet, with the addition of 64 new low-floor, biodiesel buses. The purchase reinforces TriMet’s commitment to reducing fleet age while improving reliability and customer comfort. We’ll also begin replacing buses that serve our LIFT paratransit service riders, with the addition of 67 replacement buses and ten expansion buses, to help meet growing demand. The $710 million operating budget also begins implementation of the Keep Oregon Moving law, which provides the state’s first-ever ongoing source of funding for expanding transit. TriMet will launch a low-income fare program on July 1, 2018, thanks to funding from the legislation. The program will reduce the cost of transit by at least half, for qualifying families and individuals living at up to 200 percent of the federal poverty level. Upgrades to TriMet’s safety and security systems are also prioritized in the FY2019 budget. Highlights include a contract with Portland Patrol Inc. to add as many as 30 peace officers to the system. The officers will provide an increased security presence and enforce TriMet code, including fare requirements. In addition, TriMet will continue a multi-year project to replace closed-circuit security cameras and make pedestrian safety improvements along the MAX Blue Line in Beaverton, Gresham and Hillsboro. TriMet will also complete federally mandated Positive Train Control upgrades on WES Commuter Rail. Capital investments for FY2019 include light rail vehicle, station and right of way maintenance as well as the expansion and upgrade of TriMet facilities to meet public demands for more service. TriMet will continue renovating MAX Blue Line stations and will further development of the Division Transit and Southwest Corridor projects. Additional improvements will be made along the MAX Orange Line to improve station access and pedestrian and bicycle safety near light rail tracks. With the rapid growth that’s projected in FY2019, TriMet intends to increase its work force by nearly 200 positions, more than three-quarters of which will have labor union representation. Wages for union employees are budgeted to increase by nearly 3.25 percent under the working and wage agreement adopted in 2017. Non-union employees will also be eligible for merit and pay equity increases in the new budget cycle. At the same time, TriMet will continue reforming active employee and retiree benefit costs. 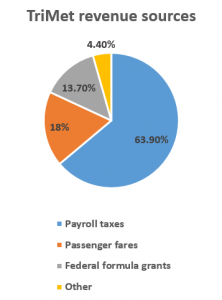 The FY2019 budget is funded through three primary sources: payroll taxes, passenger fares and federal formula grants. As of January 2018, payroll taxes were paid by employers and the self-employed at a rate of 0.7537 percent. On July 1, 2018, the Oregon Department of Revenue will begin collecting an employee payroll tax of 0.10 percent under the Keep Oregon Moving Law. TriMet anticipates receiving the first of those funds as early as January 2019. TriMet’s FY2019 budget does not include a fare increase for the sixth straight year. TriMet’s public transit system belongs to everyone, and we’re working to give riders and non-riders alike, an opportunity to let us know how we’re doing. Join us at a listening session or future service workshop and help us envision the Portland-area’s transit system of the future. Find a list of remaining dates and RSVP at trimet.org/hello or visit trimet.org/futureservice to take part in an online survey.